What exactly are digestive enzymes for dogs? What are the best digestive enzymes for dogs? How to add digestive enzymes to dog food? Are digestive enzymes recommended for dogs with pancreatitis? Are human digestive enzymes safe for dogs? Are digestive enzymes better than probiotics for dogs? Digestive enzymes for dogs are special proteins whose job is to break down macronutrients from the ingested food. In healthy dogs, digestive enzymes are produced by the pancreas and will quickly decompose fats, carbohydrates, fibers and other proteins to fasten and smoothen digestion. Often confused with probiotics, these two are completely different in many ways: digestive enzymes are produced by a dog's body whereas probiotics are not. Also, enzymes may be medically required if the dog's pancreas is not produced enough of them, while pre/probiotics are simply supplements. Do not get me wrong, both are often delivered together in commercial supplements and they aren't enemies at all. They simply are not fulfilling the same jobs and a dog without probiotics can live a happy life while a dog without digestive enzymes will eventually die. As a dog owner, you must ensure that you do not buy digestive enzyme supplements for dogs simply based on their claims: the Food & Drug Association has low guidelines and rules making it very easy for manufacturers to advertise big claims without backing these up. This is why we have reviewed and shortlisted the top 5 best digestive enzymes for you to buy. Digestive enzymes are specifically coded proteins produced by the pancreas that target and break down proteins, fats, carbohydrates, and fiber. Specifically, they are protease (protein), lipase (fat), amylase (carbohydrate), and cellulase (fiber). They work in the small intestine where the majority of nutrients are absorbed for metabolism. There are different types of pancreatic insufficiency. The one common in dogs is idiopathic pancreatic acinar atrophy. An idiopathic condition is one of an unknown cause. Acinar is the type of cells that produce the enzymes in the the pancreas, and atrophy means that the cells in the pancreas that should be producing enzymes are shrinking or becoming less viable. This type of pancreatic insufficiency (also called exocrine pancreatic insufficiency or EPI) is believed to be hereditary especially in German Shepherds. Veterinarians make the diagnosis based on clinical symptoms and by looking at levels of a trypsinogen. In EPI, levels of trypsinogen will be reduced. Digestive enzymes are not a supplement for dogs that have EPI. 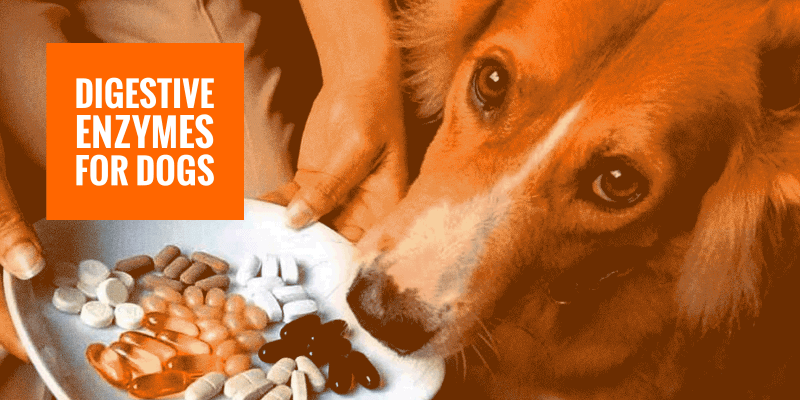 Instead, digestive enzymes are a medical necessity for EPI-affected dogs. Dogs will have to have replacement enzymes added to the diet for life in order to maintain weight and health. One of the byproducts of domestication of dogs has been that a dogs diet has become less like its wild wolf ancestors and more humanlike. Dogs are not strictly carnivores like their wild ancestors. They are more omnivores. The average diet of dogs is approximately a quarter protein. The digestive system of dogs has not really caught up to the the variety that now makes up the average dogs diet. It is not unusual for dogs of certain breeds to have allergies to wheat, soy, and other grains (calling for a grain-free diet). Canine digestive enzymes can help dogs process parts of the diet that the biology has not quite caught up with yet. Digestive enzymes can be sprinkled on food, and there are many brands on the market. They come in various forms but mainly pastes, powders, and capsules. Dogs that are started on digestive enzymes as an aid to digestion and are not suffering from EPI should be started off with the small doses at first. Some dogs do not like the taste of powder on food, and some dogs will have vomiting and other digestive upset (e.g. diarrhea) when first started on digestive enzymes. If a dog refuses to eat food with the powdered enzyme or if vomiting continues for more than a couple of days after starting supplementation, a change in the brand of digestive enzymes may be worth a try. Some dogs with underlying gallbladder or liver disease may have particular trouble in digesting fats. In general, a low-fat diet will help when the digestive enzyme supplementation is begun. Pancreatitis or inflammation of the pancreas can be either acute or chronic. 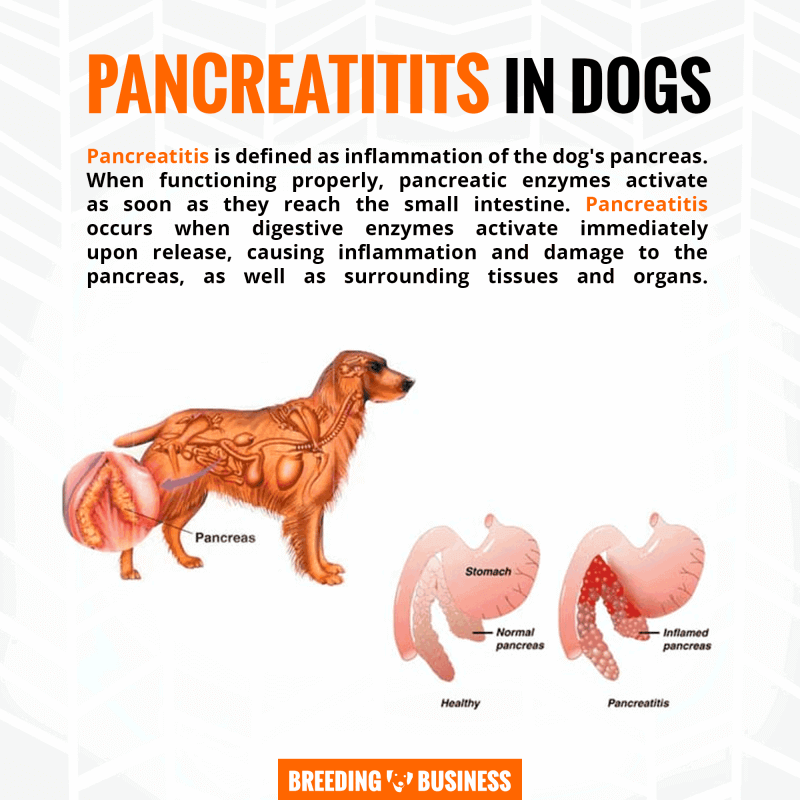 Acute pancreatitis can be fatal in dogs. Symptoms include pain, vomiting, diarrhea, fever, dehydration, and loss of appetite. Causes of pancreatitis include a high fat diet, obesity, and diabetes. Some veterinarians recommend digestive enzymes in dogs with pancreatitis because the supplementation takes some of the load off the pancreas. Other causes of pancreatitis include tumors (benign and cancerous) and a diet high in table scraps. It is very important to get guidance from a veterinarian before introducing a digestive enzyme in the diet of a dog with pancreatitis. It is a serious disease. Self-help is not possible for pancreatitis—it requires veterinary attention. Pancreatitis occurs when digestive enzymes activate immediately upon release, causing inflammation and damage to the pancreas, as well as surrounding tissues and organs. Human enzymes may be used in dogs. In fact, in one study, an enzyme was marketed as specifically for canines but contained the same enzymes as the human supplement. Some veterinarians are skeptical about whether digestive enzymes and probiotics can survive the highly acidic environment of the canine stomach. The chemicals that function as a catalyst for the breakdown of protein, fats and carbohydrates may be exactly the same in dogs and in humans, but the delivery system must be different because the dogs digestive system has some features unique to dogs. For example, digestion in humans begins with enzymes produced in saliva. Dogs have no digestive enzymes in their saliva. The particular digestive enzyme found in human saliva does not even exist in a dogs mouth at all. Digestive enzymes are a medical necessity in dogs with EPI, so they are not strictly supplements like probiotics. The two cant really be equated in that fashion. One is not better than another, but they have different uses and do work well together. The best digestive enzymes for dogs are expensive. The treatment of EPI is costly in itself. Prescription strength digestive enzymes can cost $500 to $3000 a year. In general, a daily probiotic is a safe supplement for dogs. One of the risks of adding digestive enzymes is that a dogs body will stop naturally producing the enzymes. This kind of problem does not occur with probiotics since they are an added living organism not produced naturally by the dogs body. In other words, supplementation with digestive enzymes can actually cause more of a problem than it fixes, therefore calls for a vet's opinion after study of your dog's body, shortcomings, and requirements. Now that you know how valuable digestive enzymes for dogs are, we want to offer you a shortlist of the best products currently available to buy. There are a lot of low quality products available due to low regulations from the Food and Drug Administration federal agency in the United States, so make sure you try to follow our below recommendations! The NaturVet Digestive Enzymes With Probiotics is one of the most useful digestive enzymes that work well in improving the overall digestive health of your dog. It contains the four basic enzymes namely protease, cellulase, amylase and lipase. Protease hydrolizes the protein, cellulase helps in breaking down the cellulose, amylase hydrolizes the starch and lipase hydrolizes the triglycerides (fats). This much-appreciated product from NaturVet has been formulated by veterinarians in the USA and it is known for supporting diet change and a healthy digestive tract in your dog. The NaturVet Digestive Enzymes Plus Probiotic also incorporates the good bacteria called bacillus coagulans, which further help in maintaining the gut health of your dog. The other ingredients include dried aspergillus niger, fructooligosaccharide, dried trichoderma longibrachiatum, carica papaya, dried aspergillus oryzae, maltodextrin, and bacillus coagulans. The average calorie content is 4700 kcal/kg or 4.9 kcal/1 quarter teaspoon. Available in powder form, it can be sprinkled over your dogs wet food. Intermittent feeding of this enzyme regularly can reduce symptoms of bloating, constipation and other-digestion related issues in your dog. This enzyme helps your furry one derive and utilize the nutrients from his/her food to the maximum possible extent. Dr. Mercola's Digestive Enzymes are a 5-ingredient enzyme formula that effectively takes complete care of the digestive health of your dog. Incorporating bromelain, amylase, protease, lipase, betain HCI, and papain, this digestive enzyme boosts up the immune system of your dog, especially if he/she has been weakened by some prolonged treatment with antibiotics. 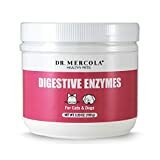 The unique selling point of this high-quality digestive enzyme is that all the ingredients are human-grade and naturally sourced, ensuring that the product is absolutely safe and beneficial for all breeds of dogs. Dr. Mercola Digestive Enzymes for Dogs serve multiple purposes like flushing away toxins, stimulating the renewal of cells and strengthening the overall immune system. The enzyme has been found to be effective for dogs with chronic pancreatitis or diabetes. Prolonged use of this enzyme that is available in powder form and can be sprinkled over your dogs wet food, can lead to positive results like weight gain, normal stool, higher appetite and so on. As with all other enzymes, this particular product too might not work very effectively in improving the digestive health of some dogs. Another drawback of this product is its rising costs, which is a matter of concern for many dog owners. However, you get what you pay for and quality does indeed come with a higher price tag! The Pet Balance Enzymes is definitely one of the best all-natural and organic digestive enzymes for dogs available out there. The product incorporates a total of 11 enzymes, all of which are plant-based and 100% natural, thus turning out to be one of the best digestive enzymes for dogs with a vegan diet. These digestive enzymes for pets contain no traces of wheat, soy, artificial flavours or preservatives whatsoever. The Natural Enzyme by Pet Balance with all its goodness is highly recommended for dogs that have been suffering the consequences of age, prolonged medication, toxins, and so on. This dietary supplement provides your dog with the essential enzymes to help him recover from digestive issues and improve his/her overall metabolic system. Another positive aspect of this product is that it is completely unflavoured and can, therefore, blend with any dog food diet perfectly enough not to disappoint the picky dogs. While this natural enzyme is a much-recommended product, some dog owners complain that it upsets their dogs stomach instead of being beneficial to their gut health. However, it is good to remember that every dogs gut makeup is different and any digestive enzyme can be really beneficial for one dog and not so useful for the other. It's a matter of trying a few products to see which one works best. 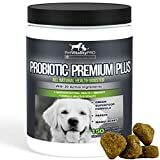 The PetVitalityPRO Digestive Enzymes for Dogs is an excellent digestive enzyme that brings together a combination of probiotics, prebiotics, enzymes, vitamins, minerals, antioxidants and phytochemicals in one single product. This product from PetVitalityPRO contains 20 natural ingredients, all of which ensure careful selection and high quality. The primary ingredients include maqui, papaya, berry along with a blend of green superfood. Made in the USA, this product is rich in its probiotics content, so much as to supply 2 billion colony-forming units of probiotics with every single chew. The PetVitalityPRO Natural Digestive Enzymes work well in not only enhancing the digestive health of your dog but also strengthening his overall immune defense system. The purpose of this quality supplement is to provide your dog with essential elements and good bacteria that are most often absent from the commercially produced raw or even processed dog food. Meant for intermittent or supplemental feeding, this enzyme effectively eliminates possibilities of inadequacy of nutrients in your dogs daily diet. As most other types of digestive enzymes, this too might not work with equal efficiency for some dogs. Also, these are chews and not powder and so your dog might not be too welcoming to this particular enzyme. Some other dogs, however, much prefer chews during the day than any sprinkling on their dog food at mealtime. 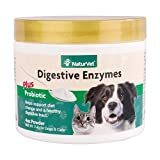 The Deley Naturals with 6 Digestive Enzymes is one of the best digestive enzymes for dogs out there, boasting of not just the four basic enzymes but a total of six digestive enzymes supplying 4 billion CFUs of probiotics. As a 100% natural supplement, this probiotics for dogs is absolutely devoid of any sort of artificial flavour or preservatives whatsoever. The best thing about this Deley Naturals supplement is that it effectively reduces your dogs allergy symptoms. Other benefits of this product include reducing digestive symptoms like diarrhoea, gas and constipation, treating bad dog breath and improving the overall immune defenses of your furry one. These Probiotics and Digestive Enzymes for Dogs from Deley Naturals contain 120 soft chews in a pack with each chew of 4 grams packed with goodness. Prolonged use of this enzyme can reduce symptoms like bloating, gas, allergies and constipation in your dog. Entirely made in the USA, this enzyme in the form of chew is made tasty enough for your dog to simply love it. The company offers a hassle-free refund policy for you to get refunded in case the product turns out to be not so useful for your dog.